easyJet's recent announcement that it plans to open a new base at Barcelona El Prat Airport from Feb-2016 provides an opportunity to examine the recent traffic history of Europe's leading LCC airport. Barcelona is home to IAG subsidiary Vueling, the biggest operator at the airport and Europe's third largest LCC. Vueling's nearest competitors here are Ryanair and easyJet, ranked first and second among European LCCs. The narrative at Barcelona remains substantially about short and medium haul and the main protagonists continue to be Europe's leading LCCs. However, there is an emerging sub-plot, albeit one that remains in the background for now. This concerns the global super-connectors, who aim to turn Barcelona's paucity of long haul destinations to their advantage. Traffic growth at Barcelona was strong before the global financial crisis, but slumped in 2008 and 2009. It bounced back quickly in 2010 and 2011, before the demise of Spanair interrupted the resumption of rapid growth. After various twists and turns in the traffic growth path of the three leading airlines at Barcelona, all three now look ready to battle hard, particularly for business passengers. In 2014, the number of passengers at Barcelona El Prat reached 37.5 million, an increase of 6.7% on the year before, after two years of relatively stable traffic numbers. The airport had seen growth of around 10% pa in each of the three years prior to the economic crisis, but numbers collapsed by 7.8% in 2008 and by 9.4% in 2009, losing more than five million passengers over two years. The recovery was strong initially, with traffic growing from 27.4 million passengers in 2009 to 34.3 million, higher than the pre-crisis peak, just two years later. However, by 2013, the figure had increased by less than one million to reach 35.2 million, before the acceleration of growth seen in 2014. In the first five months of 2015, growth has continued at a healthy rate of 5.4% (data source: AENA). BCN's passenger traffic recovery was healthy in 2010 and very strong in 2011 (up 17.7%), when Ryanair increased its passenger numbers almost four-fold and easyJet by one and a half times (Vueling grew at the relatively slow rate of 7% in 2011). The pace of recovery at BCN was then challenged by the collapse in Jan-2012 of local airline Spanair, which carried more than four million passengers at Barcelona in 2011, representing almost 13% of the airport's total. Low cost carriers easyJet and in particular, Ryanair, had already started aggressively increasing their presence at BCN in 2011, when Spanair was already in financial distress. This expansion by Europe's two largest LCCs continued in 2012, with Ryanair increasing its passenger numbers at the airport by 50% (although easyJet's growth slowed to 7% in 2012). Vueling, the leading airline at BCN, which had been flat-footed by its rivals' rapid growth in 2011, responded with growth of 35% in 2012. Traffic growth by Vueling, Ryanair and easyJet more than absorbed the four million passengers previously carried by Spanair, but overall passenger numbers only grew by 2.2% in 2012. In 2013, sharp increases in airport charges imposed by BCN's parent company AENA led to capacity cuts by Ryanair, whose passenger numbers at the airport dropped by 18%. EasyJet also saw traffic fall at BCN in 2013, when its passenger numbers declined by 7%. By contrast, Vueling continued to grow traffic in 2013 (by 16%), extending its leading market share. The upshot was that total passenger numbers at the airport were flat in 2013 (up 0.3%). Vueling carried 35% of passengers at BCN in 2013, up 10 ppts from 25% in 2010. Ryanair's share in 2013 was 12%, up from less than 3% in 2010, but down from 15% in 2012. In 2014, Ryanair returned to growth at BCN, increasing its passenger numbers by 12% and its market share to just below 13%. Vueling also grew its traffic faster than the airport as a whole in 2014, increasing passenger numbers by 13% and its market share to almost 37%. EasyJet passenger numbers were just below flat year on year and its 2014 market share was less than 8%. In the first five months of 2015, Vueling and Ryanair have continued to match each other's passenger growth rate, both growing by 25%. easyJet has continued its modest decline, seeing a 1% drop in passenger numbers year to date. Among the other airlines operating at BCN, Lufthansa (4% share of passengers) has grown rapidly in the first five months of 2015, with passenger numbers up by 17%, after a fall of 2% in 2014. Iberia has also returned to growth (up 6% 5M2015), after a drop of 8% in 2014 and of 22% in 2013. Air Europa's 2015 year to date passenger numbers are down 5%, following a 2% drop in 2014. Its share of traffic in 5M2015 is 3%, versus almost 6% in 2010. Norwegian continues its very rapid growth, albeit from a low base, gaining 60% in 2015 year to date, after compound average growth of 37% pa from 2010 to 2014. British Airways has been growing steadily at BCN in recent years and its passenger numbers were up 9% in the first five months of 2015. Air France, with a 2% share of passengers, has reversed its declining trend of 2013 and 2014 to see 1% growth in 2015 year to date. Low cost carriers account for 65% of passenger numbers in 2015 year to date (Jan-May), compared with 35% in 2010. A number of other airlines have also enjoyed strong double digit rates of growth in passenger numbers in 2015 (Jan-May). These include Wizz Air, KLM, Transavia, Germanwings, and the global super-connectors Emirates, Turkish Airlines and Qatar Airways. Etihad is the only one of the three Gulf-based super-connectors that is not present at BCN (although Air Europa carries the EY code on its BCN-Madrid service under a codeshare agreement with Etihad). Emirates, Turkish Airlines and Qatar Airways each have around 1% of passenger numbers at BCN. As an important market with little in the way of long haul destinations, particularly in Asia Pacific, Barcelona seems likely to see further growth from these airlines, which can offer connections to Asia Pacific via their hubs in Dubai, Istanbul and Doha. Vueling now has an interline agreement with Qatar Airways at BCN (a 10% shareholder in Vueling's parent IAG) and this relationship must surely develop further. 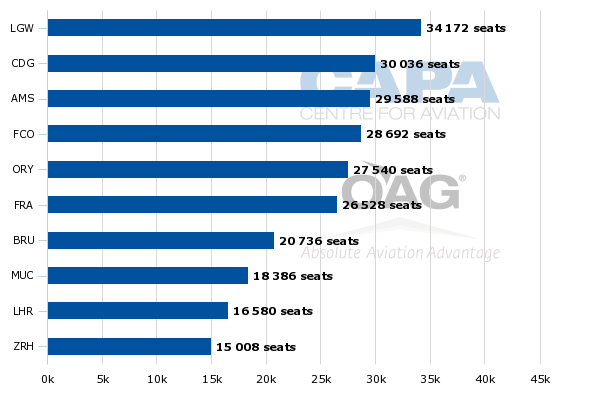 According to OAG data for the week of 29-Jun-2015, LCCs account for 68% of seats at Barcelona. It has more seats operated by LCCs than any other airport in Europe, according to the same source. Vueling has a 39% share of seats at BCN for the same week, which compares with its 36% share of passenger numbers for Jan-May 2015. The difference between these two figures partly reflects Vueling's seasonality at the airport, which varies more than that of its leading competitors. It has a higher share in the peak summer months than it does in the winter season. In 2014, Vueling's Jan-May traffic share was 30%, whereas its calendar year share was close to 37%. The significant improvement in its Jan-May 2015 share suggests that its calendar 2015 share will also increase. However, Vueling also operates at a lower load factor than either of Ryanair or easyJet. Moreover, its load factor in the first five months of 2015 has fallen year on year, by 1.5 ppts to 77.6% (across all airports in its network). This compares with load factors in these months of 85% to 93% for easyJet and 83% to 92% for Ryanair across their networks. In spite of its lower load factor, Vueling has significantly extended its leading position by passenger numbers at BCN, as noted above. It also has a far more extensive network from the airport than those of its nearest rivals. According to OAG data for the week of 29-Jun-2015, Vueling operates from Barcelona to 144 destinations, Ryanair to 40 and easyJet to 14. Iberia only has six destinations, only one of which, London Gatwick, is international. The two Spanish subsidiaries of IAG both operate to Gatwick, in addition to two domestic cities: Madrid and Salamanca. IAG's third main airline, British Airways, operates to Gatwick and Heathrow from BCN. On BCN-Gatwick, Vueling carries the BA code under a codeshare agreement. It also carries the BA code on other UK destinations Belfast, Birmingham, Cardiff and Manchester (as well as to some other destinations in Europe). Barcelona El Prat is dominated by short and medium haul routes. 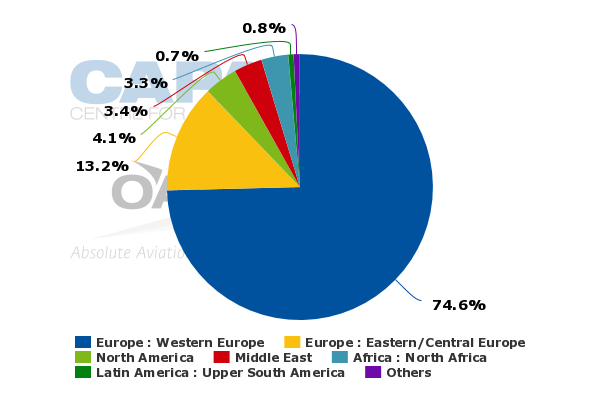 According to OAG data, 28% of seat capacity is in the domestic market and 94% of international seat capacity is to Europe, North Africa, or the Middle East (week of 29-Jun-2015). Just 4% of seats are to North America and 2% to all other regions. There is just one destination in Asia Pacific (Singapore, operated by Singapore Airlines, both direct as a stop on its Sao Paulo service and indirect, via Milan Malpensa). 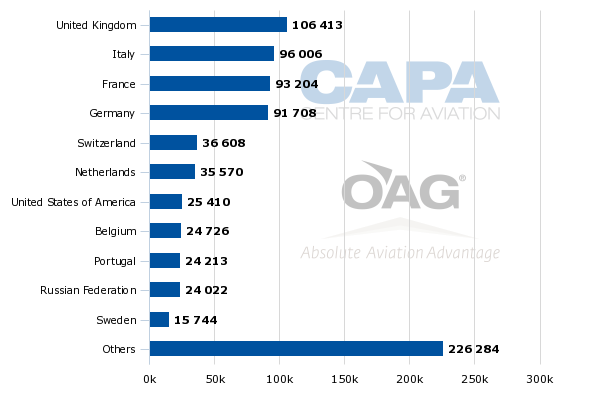 Almost half of international seat capacity from BCN is accounted for by Europe's big four nations, UK, Italy, France and Germany, each with a similar level of capacity from the airport. The Spanish domestic market has around three times the number of seats from BCN compared with each of these four countries. Vueling is the leading airline by seats from BCN to Spain, Italy and France (with more than 50% of seats in these markets) and is number two (behind Lufthansa) to Germany. However, on routes between BCN and the UK, which is the airport's largest international country destination, Vueling is only in fourth place, with a seat share of 15% (week of 29-Jun-2015, source: OAG). The UK is also the most competitive of these large markets from BCN, the only one where no operator has more than 50% of seats (if we add the share of Lufthansa and Germanwings together on Germany routes). EasyJet, Ryanair and BA all have a seat share of 20% or more on UK routes, which also include LCCs Monarch, Jet2.com and Norwegian. The biggest route from the airport is BCN-Madrid, although competition from rail has seen air traffic eroded in recent years. It is dominated by Iberia, for whom this route is a key hub feeder, in addition to an important link between Spain's two biggest cities. Iberia has 73% of seats on this airport pair, followed by Vueling (18%) and Air Europa. Nevertheless, Iberia CEO Luis Gallego reportedly said earlier this year that the route is loss-making for the airline and that he is considering transferring capacity to Vueling, or Iberia Express or even Air Nostrum. BCN-MAD is almost twice as big as the next biggest destination, Palma de Mallorca, where Vueling leads (52% of seats), followed by Air Europa (30%) and Ryanair. Ibiza is BCN's number three destination by seats and Vueling dominates this route, with a 79% share versus Ryanair's 21% (week of 29-Jun-2015, source: OAG). The three leading domestic routes by seat numbers (discussed above) are all bigger than the leading international routes from BCN. The list of top ten international airport destinations is dominated by European capital cities and those with major hubs. 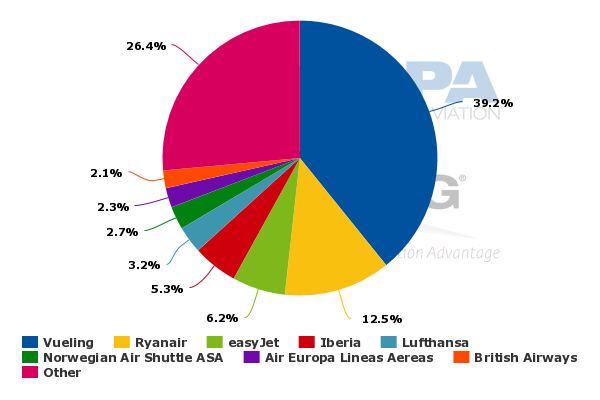 For the week of 29-Jun-2015, data from OAG show that the biggest international airport pair from Barcelona is BCN-London Gatwick, on which easyJet is the leader with 40% of seats, followed by Vueling on 29%, BA on 14%, Monarch, Norwegian (both around 8%) and Iberia with less than 1%. Heathrow is the number nine international airport destination from BCN. The market from Barcelona to all London airports is around twice as big as the BCN-LGW airport pair by number of seats (but still smaller than the BCN-MAD domestic route). BA is the leader on the city pair with a 33% share, ahead of easyJet on 27%, Ryanair on 16%, Vueling on 15%, Monarch, Norwegian (both around 4%) and Iberia with less than 1%. 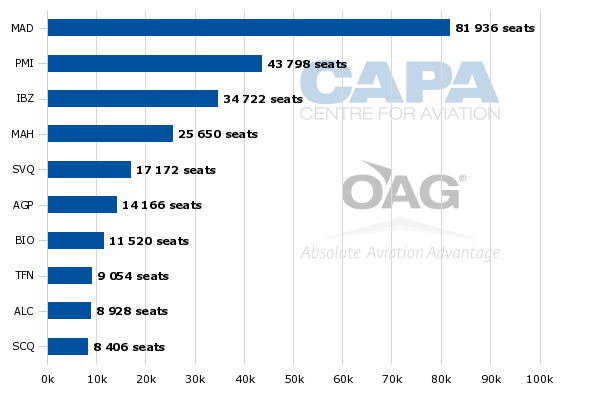 IAG airlines have almost half of the seats on this important city pair. Barcelona to Paris is only a little smaller as a city pair than Barcelona to London. Vueling is the leader on this city pair with a 45% share, followed by Air France with 28%, Transavia, easyJet (both around 9%) and Ryanair on 8%. Barcelona to Rome is the third biggest international city pair from BCN. Ryanair is the largest airline with 43% of seats, followed by Vueling on 34% and Alitalia on 23%. On BCN to Amsterdam, the number four international city pair, KLM leads with 40% of seats, just ahead of Vueling's 39%, but the Air France-KLM group is also represented by Transavia's 21% share. Lufthansa dominates the BCN-Frankfurt route, with a seat share of 84%, ahead of Vueling's 16% for the week of 29-Jun-2015, although Vueling has increased its share by more than 1ppt since the equivalent week in 2014 and by 7ppts since the same week in 2013. Both cut capacity on this route in 2014. The situation is similar on the route to Lufthansa's other main hub, Munich, although the German airline's share is slightly lower, at 67%, and Vueling has 33%. The two airlines' seat shares have been fairly stable over the past two years, albeit with a significant capacity cut by both in 2014 relative to 2013. This scenario has also been repeated on BCN to Zurich, the main hub of the Lufthansa group's SWISS, which has 72% of seats versus Vueling's 28%. It seems that Lufthansa group airlines struggle to maintain capacity on routes where Vueling competes, even if they remain the leader by some distance. This suggests that it has a significant downward impact on fares, making it less profitable for Lufthansa to keep previous levels of capacity. It also suggests that Lufthansa is keen to maintain this presence, despite clearly entering into loss-making territory. How long this strategy can last is a matter for conjecture. On the city pair BCN to Brussels, Ryanair (which operates to both of Brussels and Brussels South Charleroi) is just ahead of Vueling, although both have 37% of seats, and Brussels Airlines has 26%. For 2015 as a whole, Vueling plans to increase its capacity at BCN by 31%. According to CAPA research, it will have launched 19 new routes over the course of the summer 2015 schedule (see table below). On nine of these new routes, Vueling is the only operator. The ten new Vueling routes where it faces competition are Basel (easyJet), Belfast (easyJet to Belfast International), Birmingham (Monarch, Ryanair and Norwegian), Dublin (Ryanair and Aer Lingus), Geneva (easyJet and SWISS), Istanbul Sabiha Gokcen (Turkish to Ataturk; Pegasus, Turkish and KD Air to Sabiha Gokcen), Madeira (TAP), Manchester (Monarch, Ryanair, Jet2.com), Rotterdam (Transavia) and Moscow, where Vueling has added Sheremetyevo to its Domodedovo service from BCN (the city pair also includes Aeroflot, Transaero and Ural Airlines). Vueling is also reportedly considering new routes to Baku, Beirut and Reykjavik, pushing the short and medium haul envelope that can be served with narrow body aircraft. Although easyJet has seen modest declines in its passenger numbers at BCN in 2014 and 2015 (year to date), it announced on 18-Jun-2015 that it will open a new base at the airport in Feb-2016. It will base three aircraft at BCN, but has not given any sign that it plans to open new routes. The main advantage to it in basing aircraft there is that it will be able to benefit from earlier departures and, possibly, later arrivals, since aircraft and crew will be there overnight. It should also be able to increase frequencies. These factors will mainly be of interest to business travellers. As easyJet said in a statement, "Barcelona has always been a key network point for easyJet", adding that "business travellers will be able to benefit from earlier departures as well as an increased number of flights on existing routes connecting to primary airports in Europe such as London, Paris, Geneva and Milan." Vueling's superior scale and pan-European network from BCN should still give it a strong advantage at BCN, particularly also given its reputation for premium-like product features and its transfer product. Nevertheless, easyJet's plans are clearly aimed at eating into Vueling's share of business traffic from BCN to key European business centres. Ryanair is also continuing to make inroads into the business traveller market and is growing fairly rapidly at BCN. With LCCs taking around two thirds of traffic at Barcelona, it is Europe's leading low cost airport by seat numbers, yet it is increasingly becoming a battle ground on which LCCs compete for high yield passengers.